I searched around the kitchen today looking for my next composition and almost neglected this onion which I bought at the supermarket the night before (I don’t always put things away immediately). The bag was a bit of a challenge. I hope it comes across as a plastic bag. 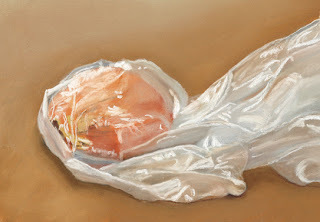 If I were to paint it over again I would paint the entire onion first and then lightly suggest the bag over it.